Not to be confused with William Wilder. Billy Wilder (/ˈwaɪldər/; German: [ˈvɪldɐ]; born Samuel Wilder, June 22, 1906 – March 27, 2002) was an Austrian-born American filmmaker, screenwriter, producer, artist, and journalist whose career spanned more than five decades. He is regarded as one of the most brilliant and versatile filmmakers of the Hollywood Golden Age of cinema. With The Apartment, Wilder became the first person to win Academy Awards as producer, director, and screenwriter for the same film. Wilder became a screenwriter in the late 1920s while living in Berlin. After the rise of the Nazi Party, he left for Paris, where he made his directorial debut. He moved to Hollywood in 1933, and in 1939 he had a hit when he co-wrote the screenplay for the romantic comedy Ninotchka, starring Greta Garbo. Wilder established his directorial reputation with an adaption of James M. Cain's Double Indemnity (1944), a film noir. Wilder co-wrote the screenplay with crime novelist Raymond Chandler. Wilder earned the Best Director and Best Screenplay Academy Awards for the adaptation of a Charles R. Jackson story The Lost Weekend (1945), about alcoholism. In 1950, Wilder co-wrote and directed the critically acclaimed Sunset Boulevard, as well as Stalag 17 in 1953. From the mid-1950s on, Wilder made mostly comedies. Among the classics Wilder created in this period are the farces The Seven Year Itch (1955) and Some Like It Hot (1959), and satires such as The Apartment (1960). He directed fourteen different actors in Oscar-nominated performances. Wilder was recognized with the American Film Institute (AFI) Life Achievement Award in 1986. In 1988, Wilder was awarded the Irving G. Thalberg Memorial Award. In 1993, he was awarded the National Medal of Arts. Samuel Wilder was born on June 22, 1906 to a family of Austrian Jews in Sucha Beskidzka. His parents were Eugenia (née Dittler) and Max Wilder. He was nicknamed "Billie" by his mother (he changed this to "Billy" after arriving in America). He had an elder brother, William Lee Wilder (1904–1982), who also became a screenwriter, film producer and director. His parents had a successful and well-known cake shop in Sucha's train station and unsuccessfully tried to persuade their son to join the family business. Soon the family moved to Vienna, where Wilder attended school. Instead of attending the University of Vienna, Wilder became a journalist. To advance his career, Wilder decided to move to Berlin, where, before achieving success as a writer, he allegedly worked as a taxi dancer. After writing crime and sports stories as a stringer for local newspapers, he was eventually offered a regular job at a Berlin tabloid. Developing an interest in film, he began working as a screenwriter. He collaborated with several other novices (with Fred Zinnemann and Robert Siodmak) on the 1929 feature People on Sunday. He wrote the screenplay for the 1931 film adaptation of a novel by Erich Kästner, Emil and the Detectives. After the rise of Adolf Hitler, Wilder, Jewish, left for Paris, where he made his directorial debut with the 1934 film Mauvaise Graine. He relocated to Hollywood prior to its release. Wilder's mother, grandmother, and stepfather all died in the Holocaust. For decades it was assumed that it happened at Auschwitz, but while researching Polish and Israeli archives, his Austrian biographer Andreas Hutter discovered in 2011 that they were murdered in different locations: his mother, Eugenia "Gitla" Siedlisker - in 1943 at Plaszow; his stepfather, Bernard "Berl" Siedlisker, in 1942 at Belzec and his grandmother, Balbina Baldinger, died in 1943 in the ghetto in Nowy Targ. After arriving in Hollywood in 1933, Wilder continued his career as a screenwriter. He became a naturalized citizen of the United States in 1939, having spent time in Mexico waiting for the US government after his six-month visa had expired in 1934, an episode reflected in his 1941 Hold Back the Dawn. Wilder's first significant success was Ninotchka in 1939, a collaboration with fellow German immigrant Ernst Lubitsch. This romantic comedy starred Greta Garbo (generally known as a tragic heroine in film melodramas), and was popularly and critically acclaimed. With the byline, "Garbo Laughs! ", it also took Garbo's career in a new direction. The film also marked Wilder's first Academy Award nomination, which he shared with co-writer Charles Brackett (although their collaboration on Bluebeard's Eighth Wife and Midnight had been well received). For twelve years Wilder co-wrote many of his films with Brackett, from 1938 through 1950. He followed Ninotchka with a series of box office hits in 1942, including his Hold Back the Dawn and Ball of Fire, as well as his directorial feature debut, The Major and the Minor. Two years later, Wilder earned the Best Director and Best Screenplay Academy Awards for the adaptation of a Charles R. Jackson story The Lost Weekend (1945), the first major American film to make a serious examination of alcoholism, another difficult theme under the Production Code. In 1950, Wilder co-wrote and directed the dark and cynical Sunset Boulevard, which paired rising star William Holden with Gloria Swanson. Swanson played Norma Desmond, a reclusive silent film star who, with delusions of her greatness from a bygone era, dreams of a comeback. Holden portrays an aspiring screenwriter who can't make ends meet and becomes a kept man to her. It was critically acclaimed, and marked the end of Wilder's long writing partnership with Charles Brackett. In 1951, Wilder followed Sunset Boulevard with Ace in the Hole (a.k.a. The Big Carnival), a tale of media exploitation of a caving accident. The idea for the film had been pitched over the phone to Wilder's secretary by Victor Desny. Desny sued Wilder for breach of an implied contract in the California copyright case Wilder v Desny, ultimately receiving a settlement of $14,350. Although a critical and commercial failure at the time, its reputation has grown over the years. In the 1950s, Wilder also directed two adaptations of Broadway plays, the prisoner of war drama Stalag 17 (1953), which resulted in a Best Actor Oscar for William Holden, and the Agatha Christie mystery Witness for the Prosecution (1957). In the mid-1950s, Wilder became interested in doing a film with one of the classic slapstick comedy acts of the Hollywood Golden Age. He first considered, and rejected, a project to star Laurel and Hardy. He then held discussions with Groucho Marx concerning a new Marx Brothers comedy, tentatively titled "A Day at the U.N." This project was abandoned when Chico Marx died in 1961. In 1959, United Artists released Wilder's Prohibition-era farce Some Like It Hot without a Production Code seal of approval, withheld due to the film's unabashed sexual comedy, including a central cross-dressing theme. Jack Lemmon and Tony Curtis play musicians who disguise themselves as women to escape pursuit by a Chicago gang. Curtis's character courts a singer played by Marilyn Monroe, while Lemmon is wooed by Joe E. Brown—setting up the film's final joke in which Lemmon reveals that his character is a man and Brown blandly replies "Well, nobody's perfect". A box office success, the film was lightly regarded during its original release. But its critical reputation grew prodigiously; in 2000, the American Film Institute selected it as the best American comedy ever made. In 2012, the British Film Institute decennial Sight and Sound poll of the world's film critics rated it as the 43rd best movie ever made, and the second-highest ranking comedy. After winning three Academy Awards for 1960's The Apartment (for Best Picture, Director, and Screenplay), Wilder's career slowed. His Cold War farce One, Two, Three (1961) featured a rousing comic performance by James Cagney. It was followed by apparently lesser films that now are of cult status, such as Irma la Douce and Kiss Me, Stupid. Wilder gained his last Oscar nomination for his screenplay The Fortune Cookie (UK: Meet Whiplash Willie) (1966). His 1970 film The Private Life of Sherlock Holmes was intended as a major roadshow release, but was heavily cut by the studio and has never been fully restored. Later films such as Fedora (1978) and Buddy Buddy (1981) failed to impress critics or the public. After that Wilder complained, futilely, that he was being discriminated against, due to his age. For whatever reason, the studios were unwilling to hire him. One "consolation" which Wilder had in his later years, besides his art collection (see "Later Life," below), was the Andrew Lloyd Webber stage musical version of Sunset Boulevard. Wilder's directorial choices reflected his belief in the primacy of writing. He avoided, especially in the second half of his career, the exuberant cinematography of Alfred Hitchcock and Orson Welles because, in Wilder's opinion, shots that called attention to themselves would distract the audience from the story. Wilder's pictures have tight plotting and memorable dialogue. Despite his conservative directorial style, his subject matter often pushed the boundaries of mainstream entertainment. Once a subject was chosen, he would begin to visualize in terms of specific artists. His belief was that no matter how talented the actor, none were without limitations and the end result would be better if you bent the script to their personality rather than force a performance beyond their limitations. Wilder was skilled at working with actors, coaxing silent era legends Gloria Swanson and Erich von Stroheim out of retirement for roles in Sunset Boulevard. In total, he directed fourteen different actors in Oscar-nominated performances: Barbara Stanwyck in Double Indemnity, Ray Milland in The Lost Weekend, William Holden in Sunset Boulevard and Stalag 17, Gloria Swanson in Sunset Boulevard, Erich von Stroheim in Sunset Boulevard, Nancy Olson in Sunset Boulevard, Robert Strauss in Stalag 17, Audrey Hepburn in Sabrina, Charles Laughton in Witness for the Prosecution, Elsa Lanchester in Witness for the Prosecution, Jack Lemmon in Some Like It Hot and The Apartment, Jack Kruschen in The Apartment, Shirley MacLaine in The Apartment and Irma la Douce and Walter Matthau in The Fortune Cookie. Milland, Holden and Matthau won Oscars for their performances in Wilder films. Wilder mentored Jack Lemmon and was the first director to pair him with Walter Matthau, in The Fortune Cookie (1966). Wilder had great respect for Lemmon, calling him the hardest working actor he had ever met. Lemmon starred in seven of Wilder's films. Some say that Wilder's films often lacked any discernible political tone or sympathies, which was not unintentional. He was less interested in current political fashions than in human nature and the issues that confronted ordinary people. He was not affected by the Hollywood blacklist, and had little sympathy for those who were. Of the blacklisted 'Hollywood Ten' Wilder said, "Of the ten, two had talent, and the rest were just unfriendly." In general, Wilder had an intense dislike for formula and genre films. Others say that his films derive their parodies from the politics of the world around him, capitalist and Communist, and that Wilder opposed the House Un-American Activities Committee (HUAC). He co-created the “Committee for the First Amendment”, of 500 Hollywood personalities and stars to “support those professionals called upon to testify before the HUAC who had classified themselves as hostile with regard to the interrogations and the interrogators”. Some anti-Communists wanted those in the cinema industry to take oaths of allegiance. The Screen Directors Guild had a vote by show of hands. Only John Huston and Wilder opposed. Huston said, "I am sure it was one of the bravest things that Billy, as a naturalized German, had ever done. There were 150 to 200 directors at this meeting, and here Billy and I sat alone with our hands raised in protest against the loyalty oath." Wilder reveled in poking fun at those who took politics too seriously. In Ball of Fire, his burlesque queen 'Sugarpuss' points at her sore throat and complains "Pink? It's as red as the Daily Worker and twice as sore." Later, she gives the overbearing and unsmiling housemaid the name "Franco". Wilder is sometimes confused with director William Wyler; the confusion is understandable, as both were German-speaking Jews with similar backgrounds and names. However, their output as directors was quite different: Wyler preferreed to direct epics and heavy dramas, while Wilder was noted for his comedies and film noir type dramas. Wilder was recognized with the AFI Life Achievement Award in 1986. In 1988, Wilder was awarded the Irving G. Thalberg Memorial Award. In 1993, he was awarded the National Medal of Arts. He has a star on the Hollywood Walk of Fame. Wilder became well known for owning one of the finest and most extensive art collections in Hollywood, mainly collecting modern art. As he described it in the mid 80s, "It's a sickness. I don't know how to stop myself. Call it bulimia if you want – or curiosity or passion. I have some Impressionists, some Picassos from every period, some mobiles by Calder. I also collect tiny Japanese trees, glass paperweights and Chinese vases. Name an object and I collect it." Wilder's artistic ambitions led him to create a series of works of his own. By the early 90s, Wilder had amassed a beguiling assortment of plastic-artistic constructions, many of which were made in collaboration with artist Bruce Houston. In 1993, art dealer Louis Stern, a longtime friend, helped organize an exhibition of Wilder's work at his Beverly Hills gallery. The exhibition was titled Billy Wilder's Marché aux Puces and the Variations on the Theme of Queen Nefertete segment was an unqualified crowd pleaser. This series featured busts of the Egyptian queen wrapped à la Christo, or splattered à la Jackson Pollock, or sporting a Campbell's soup can in homage to Andy Warhol. Wilder married Judith Coppicus on December 22, 1936. The couple had twins, Victoria and Vincent (born 1939), but Vincent died shortly after birth. They divorced in 1946. Wilder met Audrey Young at Paramount Pictures on the set of The Lost Weekend in 1945, and she became his second wife on June 30, 1949. 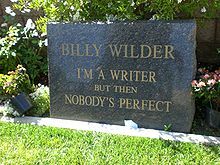 Wilder died in 2002 of pneumonia at the age of 95 after battling health problems, including cancer, at his home in Beverly Hills, California. He was interred in the Westwood Village Memorial Park Cemetery in Westwood, Los Angeles near Jack Lemmon and Walter Matthau. Marilyn Monroe's crypt is located in the same cemetery. Wilder died the same day as two other comedy legends: Milton Berle and Dudley Moore. The next day, French newspaper Le Monde titled its first-page obituary, "Billy Wilder dies. Nobody's perfect." - quoting the final gag line in Some Like It Hot. Wilder holds a significant place in the history of Hollywood censorship for expanding the range of acceptable subject matter. He is responsible for two of the film noir era's most definitive films in Double Indemnity and Sunset Boulevard. Along with Woody Allen and the Marx Brothers, he leads the list of films on the American Film Institute's list of 100 funniest American films with five films written as well as having the honor of holding the top spot on it with Some Like it Hot. Also on the list are The Apartment and The Seven Year Itch which he directed, and Ball of Fire and Ninotchka which he co-wrote. The American Film Institute has ranked four of Wilder's films among their top 100 American films of the 20th century: Sunset Boulevard (no. 12), Some Like It Hot (no. 14), Double Indemnity (no. 38) and The Apartment (no. 93). For the tenth anniversary edition of their list, the AFI moved Sunset Boulevard to No. 16, Some Like it Hot to No. 22, Double Indemnity to No. 29 and The Apartment to No. 80. Spanish filmmaker Fernando Trueba said in his acceptance speech for the 1993 Academy Award for Best Foreign Language Film: "I would like to believe in God in order to thank him. But I just believe in Billy Wilder... so, thank you Mr. Wilder." According to Trueba, Wilder called him the day after and told him: "Fernando, it's God." French filmmaker Michel Hazanavicius also thanked Billy Wilder in the 2012 Best Picture Oscar acceptance speech for The Artist by saying "I would like to thank the following three people, I would like to thank Billy Wilder, I would like to thank Billy Wilder, and I would like to thank Billy Wilder." Wilder's 12 Academy Award nominations for screenwriting were a record until 1997 when Woody Allen received a 13th nomination for Deconstructing Harry. 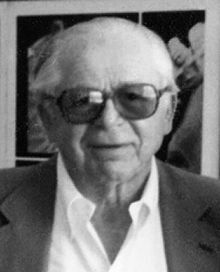 Wilder received twenty-one Academy Award nominations; eight for Best Director, twelve for writing, and one as the producer of Best Picture. With eight nominations for Academy Award for Best Director, Wilder is, together with Martin Scorsese, the second most nominated director in the history of the Academy Awards, behind William Wyler, and the second most nominated screenwriter, behind Woody Allen. Wilder won a total of six Oscars: Best Director for The Lost Weekend and The Apartment, Best Screenplay for The Lost Weekend, Sunset Boulevard, and The Apartment, and Best Picture for The Apartment. In addition, he received the Irving G. Thalberg Memorial Award in 1988. Golden Globes: Wilder won five Golden Globes after the awards started in 1944: twice as the producer of Best Picture winners (Some Like It Hot and The Apartment); twice as a director (The Lost Weekend and Sunset Boulevard); and once as a screenwriter (Sabrina) (this award wasn't presented from 1955 to 1965, during Wilder's most successful years). ^ "Oscar Firsts and other Trivia" (PDF). Academy of Motion Picture Arts and Sciences. February 2015. Archived from the original (PDF) on February 25, 2015. Retrieved May 2, 2015. ^ a b Cook, David A. (2004). A History of Narrative: Film Fourth Edition. W. W. Norton & Company. ISBN 0-393-97868-0. ^ "Billy Wilder Biography". Biography.com. 2015. Retrieved May 2, 2015. ^ Philips, Alastair. City of Darkness, City of Light: Emigre Filmmakers in Paris, 1929–1939. Amsterdam University Press, 2004. p. 190. ^ Andreas Hutter and Heinz Peters (October 6, 2011). "Gitla stand nicht auf Schindlers Liste" (in German). Neue Zuercher Zeitung. ^ Armstrong, Richard (2004). Billy Wilder, American Film Realist. McFarland & Company. p. 9. ISBN 978-0-7864-2119-0. ^ 46 Cal.2d 715, 299 P.2d 257, CAL. 1956. ^ "AFI's 100 Funniest American Movies Of All Time". American Film Institute. 2000. Retrieved June 6, 2016. ^ "One Head Is Better than Two," in Films and Filming (London), February 1957. ^ Andrew Sarris, in The American Cinema: Directors and Directions 1929–1968 (Da Capo, 1996 [originally published in 1968], p.166) commented that Wilder is too "cynical to believe even his own cynicism" and referred to the "superficial nastiness of his personality". "You Ain't Heard Nothin' Yet": The American Talking Film, History and Memory, 1927–1949 (1998) contains Sarris's revised opinion. ^ José-Vidal Pelaz López. Filming History: Billy Wilder and the Cold War. Communication & Society, 25(1), pp.113-136. (2012). ^ Ed Sikov. On Sunset Boulevard – the Life and Times of Billy Wilder "Turnaround", pg. 582. ^ Charlotte Chandler. Nobody's Perfect: Billy Wilder – A Personal Biography. "Nefertete", pg. 317. ^ Clinton, Paul (March 29, 2002). "Legendary director Billy Wilder dead at 95". CNN. ^ "Prizes & Honours 1993". Berlinale. Retrieved January 3, 2013.